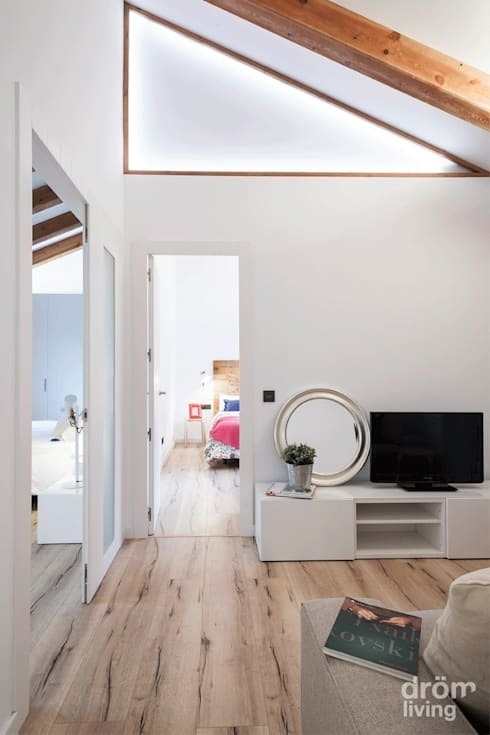 In this beautiful home in Girona, Spain, Barcelona-based architects Dröm Living have managed to pull off a true Scandinavian success story. With copious amounts of impressive carpentry work on display alongside sharply modern furniture and accessories, this interior oozes style and quality. Check it out below. This part of the home is the perfect place to start our tour, as it so fully captures the spirit of the design that we will see throughout. It’s clear to see that the people behind this space recognise the value of good wood and expert carpentry when it comes to filling a space. 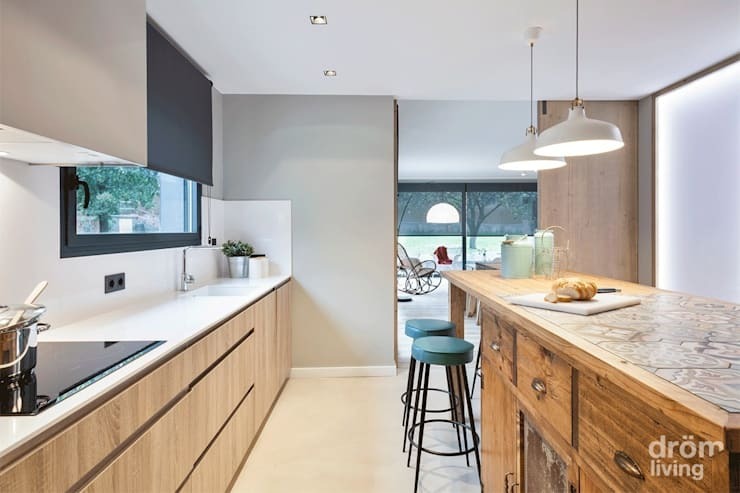 The fact that the wood used is so light in colour is key to creating that light and airy feeling typically associated with Scandinavian interior design. 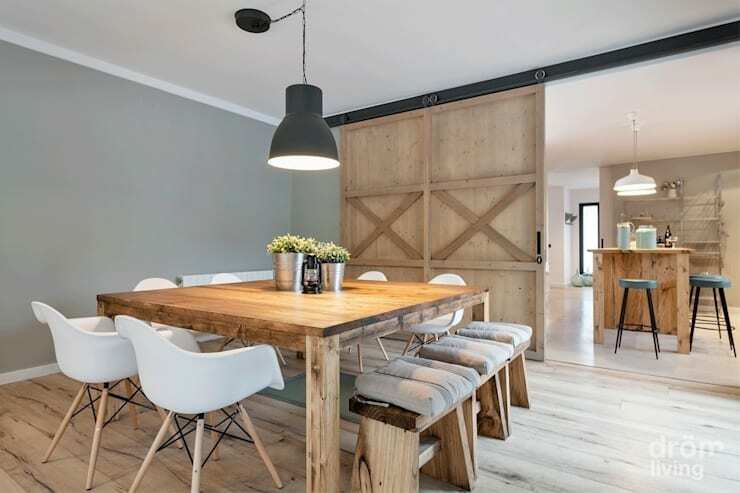 Wooden floors, stools, tables and – most impressively of all – those wonderful sliding barn-style doors all contribute to the space’s timelessly well-crafted appeal. At the same time, though, sleek and simple features such as those effortlessly cool chairs and the low-hanging overhead lamp bring things bang up to date. If we now turn to see the room from the other side, we can begin to understand a bit more about why the dining space works so well. 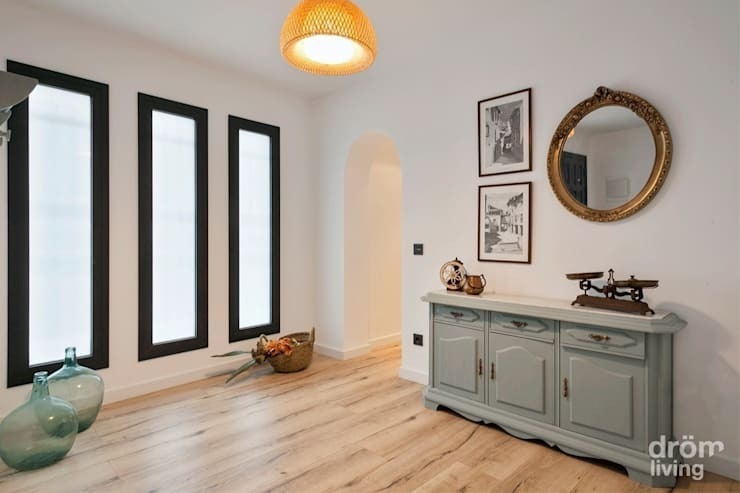 Large amounts of light enter the room via full-wall windows and glass doors, meaning that the designer could afford to cover the walls with that lovely dove grey shade of paint without worrying about making things too dark. From this angle we can also see some of the pieces that make this house feel truly like a home, such as the comfortingly old-fashioned rocking chair just visible on the left-hand-side of the photo. This space is most notable fr that fantastic triangular window, which so perfectly follows the line of the vaulted roof. The rich wood of the exposed beam above just serves to draw additional attention to this beautiful feature – as if that were needed. 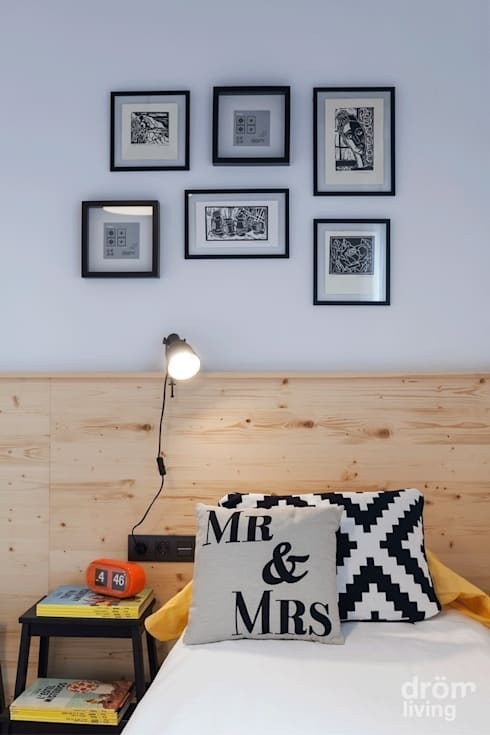 Wood takes centre stage again here, with that simple rectangular wooden headboard making a strong statement about the design priorities in this room. 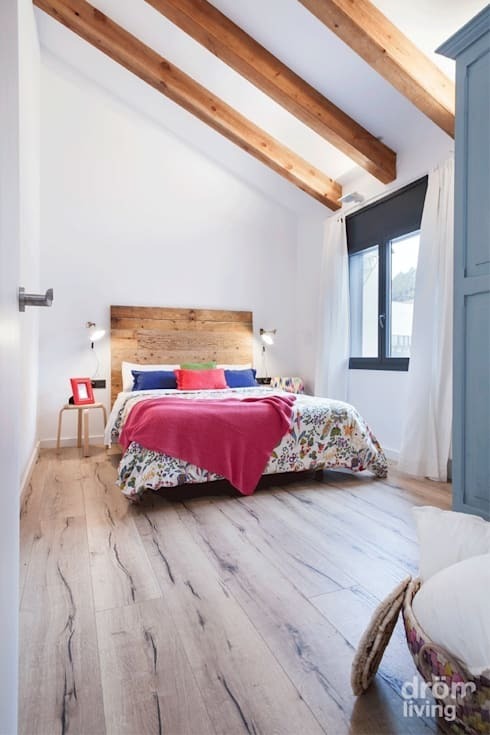 The exposed beams, stunning in their simplicity, are pretty much one of the best features any bedroom could ever hope to have, and they absolutely make this space what it is. Being inspired by Scandinavian style doesn’t mean keeping everything completely simple. There’s plenty of space for personal quirks and sweet little details, as seen here. The heavy black border of the windows seen here acts as the perfect foil to some of the more whimsical and delicate features seen in this space – such as the vintage scales seen on the sideboard and the pretty glass bottles on the floor. What features of this project do you like the most? Tell us here!